I’m so glad Jenn has agreed to share her recipe for Almond Poppyseed Bread today. She is so creative when it comes to all things food related. Her Bento designs have really taken healthy eating for kids to a whole new level. Not only are the meals nutritious, but they are also portion controlled, something many Americans have lost sight of today. I have no doubt that Kidlet will be practicing healthy eating habits for the rest of his life. Jenn, thank you so much for being here today. Hello readers of The Not So Modern Housewife! I’m Jenn from BentoForKidlet and Bonnie invited me to share a fun holiday recipe with you! When it comes to holiday cooking not only does the food have to taste good, but I personally appreciate recipes that are simple. 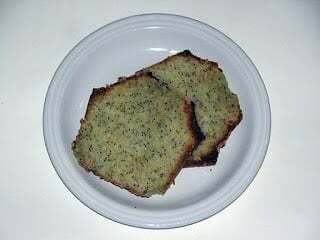 The recipe I am sharing with you today is for Almond Poppyseed Bread. 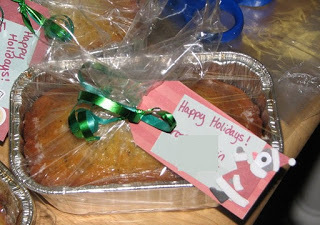 I make this every year for the holidays and even make mini loaves to send to school as teacher gifts. This recipe really couldn’t be any simpler. You dump all of the ingredients in a bowl, mix until blended and bake. Then add a delicious glaze and you have a holiday winner! I hope you will enjoy this recipe as much as my family does! 3.) Bake for 45-60 minutes (less for mini loaves) until a toothpick in the center comes out clean. 4.) Let cool for 5 minutes while you make the glaze. To make the glaze whisk together all of the ingredients. Poke holes in the bread and pour glaze over the top. 5.) Cool the rest of the way , slice, and enjoy! This looks delicious. I love the easy part of dumping everything in the bowl and mixing. HA! !